We first decided to do modeling shoots one day, Kurt and I, after we hung out on a summer afternoon. We were taking pictures so I could practice modeling and so I could get a few senior pics taken. You can view a few of the pics here. If you want to see more or the pics from the summer shoot And the fall shoot, I will post them separately soon. Anyways, we wanted to do a more high fashion and themed shoot with a purpose, rather than random places and random outfits. So I asked Kurt what he thought we could do. And we ended up choosing vintage. So began my search for the perfect items to use as props and to wear etc. Let me just start out by saying, when gathering items for a photo shoot or practically anything, GO to thrift stores. Those places are like gold mines. And if you think you are too good to shop at a thrift store, you are sorely mistaken. Give it a try. They have everything there. (I do have yet to see any secondhand good though…). Plus, thrift stores are always like at least 75% cheaper than they would be in regular stores. And more often than not, even cheaper than that. It’s really a great place to rummage. The thrift stores near me are Bethesda, St. Vincent de Paul (most of my luck comes from there; got a prom dress that’s in perfect shape for 53 cents. ), goodwill, and there’s an antique mall as well (perfect for any old vintage or older items). Especially if you’re a youth like me who can’t really spend a lot of money, thrift stores will be your best friend. 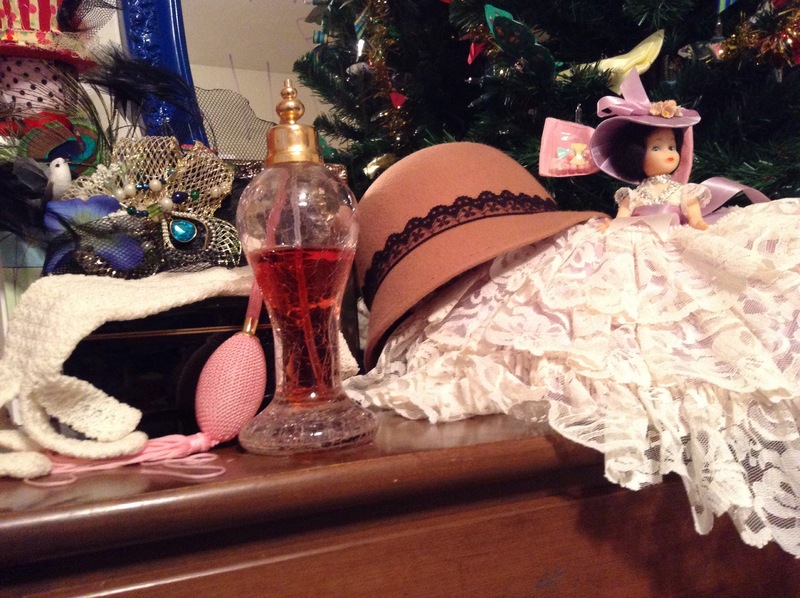 A vintage perfume bottle ($14), leather box bag ($35), old photo album with metal case (99 cents), vintage hat from Target (9$), vintage gloves ($4), photography reflector ($18), vintage doll ($1.50), red vintage dress ($7), red heels ($6). You also have to think about what you can reuse, resell, keep and collect. With that in mind, you’ll find you are more flexible about spending money. Borrowing items is of course always good because you never spend any money and you get what you need. Just make sure to give it back if they want you too. So gathering and finding the items wasn’t really a problem. I had plenty of time to do that. We did need to find someone who could do my hair and makeup (or I could try and fail myself), and a place to shoot. One day I went to get my hair trimmed at my stylists hair salon, The Designer’s Chair, and voila. I just asked her if she would like any endorsement for her salon and a model to do it. She asked how much and because I’m not part of an agency yet, I offered a TFP instead of a price. (Which means trade for photos.) this arrangement is always a perfect suggestion. For aspiring models, you get the photos you need to build your portfolio and experience as well, and the business gets photos to use as they need to advertise their store. Everyone likes a little business. And yes, modeling is all about business and how you portray yourself so if you can offer a compromise, you’re in great shape. So it worked out between Jenn and I, and she is now my hair and makeup artist. So that solved that problem. Next was the location. We knew we wanted snow on the ground. Because originally we were going to be shooting indoors and outdoors. The place that Kurt thought of was unfortunately closed to us because the organization who owned it was all the way in Green Bay with the keys. So we came up with a plan B. To use the historical Smith Octagon house owned by the Neenah Historic Society. And as it happened, that plan fell through because the woman who was going to open it for us was having family visit that weekend so she wouldn’t be around. But. Sweet Megan had a brilliant idea. Her family knows this older couple that owns an inn in Appleton rightfully named, The Appleton Inn. We looked up their website and they had the perfect kind of look. Vintage. They were contacted immediately and we got the place. It was also to be a TFP. Since their place isn’t having a ton of business, we came to help them out by doing this shoot. It’s seriously an wonderful place to go. So, there’s still more to this story! Check out part 2 of Let’s Shoot in Vintage!